Nykaa Paintstix! Lipstick - Rock n Roll Pink : Put on your dancing shoes and get ready to tap your feet to the 90 s beats with the Nykaa Paintstix! Lipstick in Rock n Roll Pink. This purple-toned pink is nothing like you've seen! Swipe this fierce hue on and don t be afraid to show your sassy self! These cute lipsticks are all you need to make your look little more fun, little more glamorous! This cruelty-free, and high-pigment formula gives you a soft, cushiony matte finish. 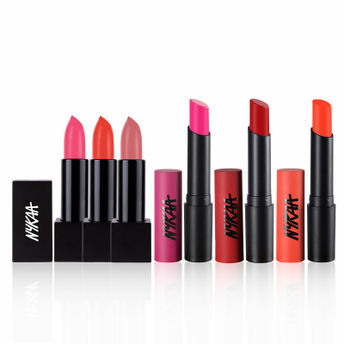 The unique formulation ensures that your lips stay comfortable, colored up and matte-smooth all day long. Another bonus: These vivid, full-coverage hues are hand-selected and named by our In-house Nykaa Panel, just in time for the most-trendiest season. The best part, these fun hues won t break the bank! Go ahead, stock em all!